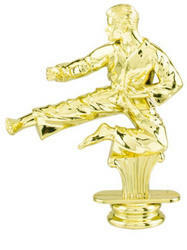 This kicking karate trophy figure is a great topper for any of our trophies. It is gold in color and is 4 1/4 inches tall. If you want to use this martial arts topper on one of our trophies, please go here Conventional Martial Arts Trophies. If you only want this martial arts trophy figure 84165, just add to cart. The cost of this figure is $3.25 when purchased separately. Save money when you buy for the entire martial arts competition, at checkout you will receive an automatic discount at 12, 50, 100 and 250 martial arts awards.